In Honiara, the capital of the Solomon Islands, last week, a summit meeting of the Melanesian Spearhead Group ended with an apparent victory for Indonesia, while the United Liberation Movement for West Papua fell short. Details from Neal Conan in our latest Pacific News Minute. The ULM, as it's known, hoped to be recognized as the representative of the people of West Papua...instead, it received observer status, and that with a twist. It's recognized only as the representative of West Papuans who live outside the country. Indonesia, which had been an observer at the MSG, was elevated to associate membership, so it will represent the people of West Papua. In its statement of acceptance of its observer status, the UMP read out charges of human rights abuses by Indonesian authorities. 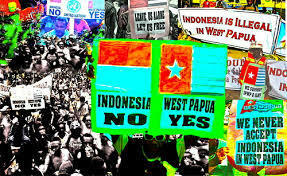 In its statement, Indonesia denied the allegations and objected to any claim by the UMP to represent the people of West Papua...Indonesia, with a population of more than 250 million, dwarfs the other MSG members, Vanuatu, Fiji, the Solomon Islands, Papua New Guinea and the New Caledonian Kanak independence movement. While the independent nation of Papua New Guinea occupies the east half of the island, the Dutch territory of West New Guinea was incorporated into Indonesia in 1962 as part of the New York agreement and the so called act of free choice that followed in 1969, when just over a thousand men and women chosen by the Indonesian military raised their hands in a show for UN observers.